Who knew how powerful a hashtag could be? Ok ok, I always said it was one incredible way to spread the word but I never expected it would be so powerful and change laws. 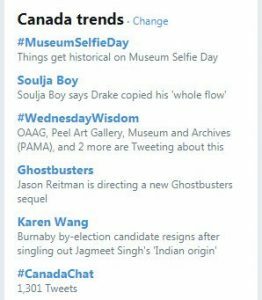 There was a feeling that #MuseumSelfie #MuseumSelfieDay was going to be big a few weeks prior as although I never care about stats I did notice I was getting a lot of hits from countries that were new to CultureThemes. Then the Sunday prior it was being promoted on a Sunday Breakfast show in the UK. All the hashtags on CultureThemes are created for small and medium museums (as large and nationals have more options to get involved). Countries that are new to social media (which we assume everyone has been on it since the beginning and that just is not true) loved that there was an excuse to be involved without red hands – you know the ones that get smacked for doing something wrong. They could simply blame a trending hashtag – Simple! 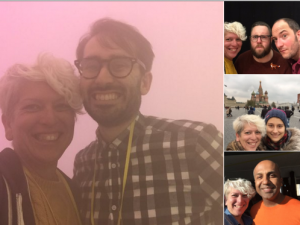 CultureThemes and MuseumSelfieDay are on twitter and Instagram but it’s always encouraged to run the hashtag on whichever platform is best for your community and followers. And I don’t mind if you change the hashtag to make sense for your own language. The idea of the museum as a dusty old repository of long-forgotten and obscure objects is an outdated concept that itself belongs in a glass case. Many institutions have brought both innovation and technology to the design of their collections, while in recent years opening them up to millions via the internet, further encouraging discovery and interaction through a variety of social media channels. 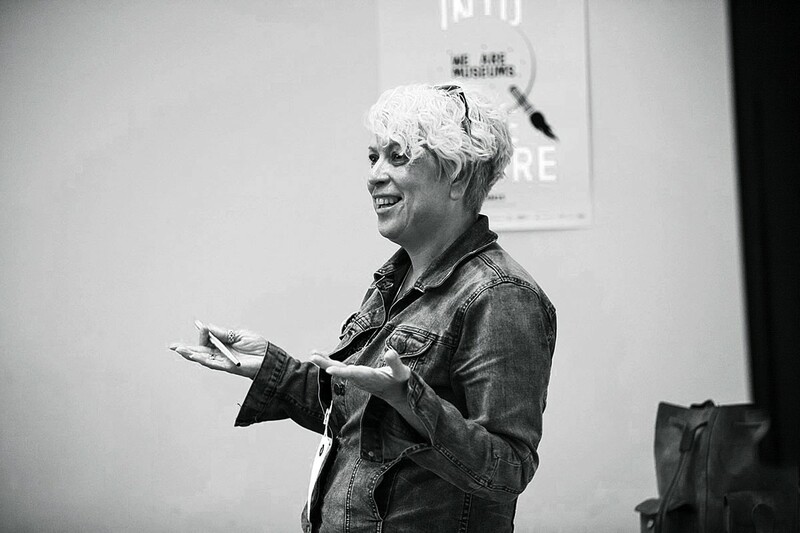 Museums have embraced platforms like Twitter and Instagram as a way of sharing their content – enticing visitors to experience it first-hand of course – and the sector has become particularly adept at engaging with its audiences in this way, with initiatives such as @52Museums and #MuseumWeekreceiving a level of traction that many companies can only dream of. What is #MuseumSelfie Day on January 20 2016? Objective: A day to share selfies either in museums or around museums. These can be on the day or ones from previous visits. This is a FUN DAY to encourage people to visit museums and participate a bit with art or collections. I’m a Cultural Snatcher – I can’t help it! I take after my mom who is never without a camera (remember Kodak Disc? I do.). When I visit and explore a museum, I love sharing what I’m seeing. While I’m not a huge fan of taking pictures of myself, I can see why people like a good old selfie. CultureThemes is a monthly hashtag I help create on Twitter. The idea behind CultureThemes is to have a positive event once a month on Twitter to highlight the fun and ‘unstuffiness’ of museums/culture. Previous tags included: #WhyILoveMuseums, #MusSocks, #MusMovember, #AskACurator day and more. We’re also behind @52Museums which you should check out if you haven’t heard about it. The idea is simple, people around the world have been asked to take selfies at museums for the past month and they will share on Twitter/Instagram using #MuseumSelfie on January 20th. The pictures could be current or from previous trips. Tag the museum if you remember! So if you’re visiting a museum this weekend, make sure you take a #MuseumSelfie and share with @CultureThemes this Wednesday! 7 days of 7 daily Hashtags – But what do each of them mean? Posing as works of culture; recreating works. Could be in front of or from online picture/postcard. Try to mimic Van Gogh or recreate a scene from an art work. This is not a simple selfie day – you should use the picture to re-create a scene. Encourage your friends and family to get involved. 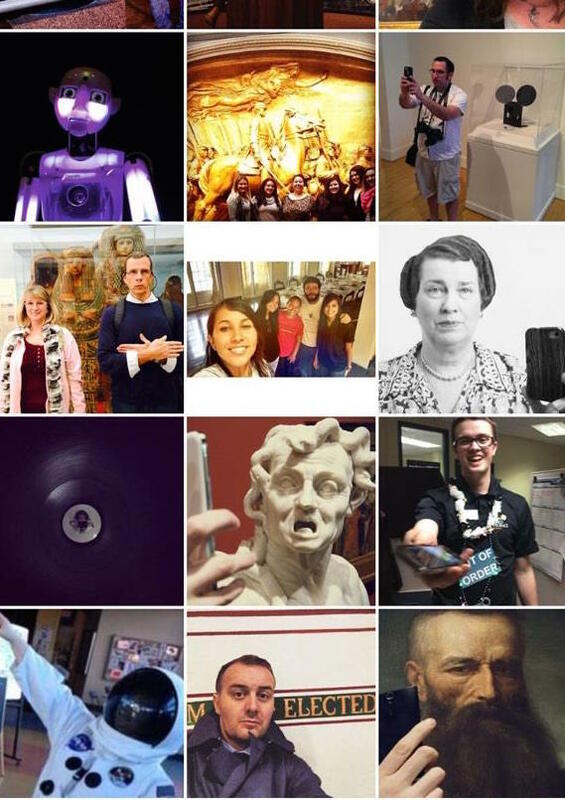 #MuseumSelfie Day 2015 – Press, Stats and More! First and foremost, a massive thank you to everyone who took part in #MuseumSelfie. ALL credit and an incredible heart-felt thank you to all the social media managers (or related title) that encouraged and inspired their visitors to take part. Without you, the hashtag would not have been successful. I’d like to thank each and everyone person who had fun and got involved with #MuseumSelfie day 2015. The number one question I get is why do I do it? The response: because majority of the public globally enjoy it. Going from the stats ran by Sree Sreenivasan and Kulturkonsorten there was A LOT of people/museums taking part. The coverage and messages received have been overwhelming positive with a dash of negativity (see HyperAllergic who labels me ‘the official ringleader of this vast criminal enterprise’ that is #MuseumSelfie). CNN coverage was lovely as they actually took the time to call and interview me. Although some say that social media is ‘old technology’ it still works to reach communities and visitors. I find it interesting that although social media has been around for years, many forget that new people sign up every day and we need to ensure that we provide platforms for them to join in and experience the fun. 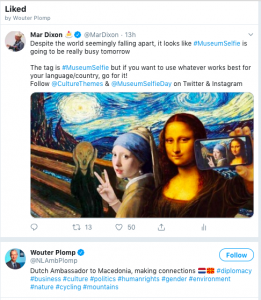 These hashtags gives museums excuses to sway a tad outside their policy of 2 tweets a day and majority have said the response is overwhelmingly positive as far as numbers going up. 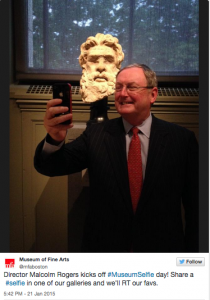 If someone said to me 2-3 years ago that the Director of Boston Museum of Fine Art would be taking a selfie of himself and sharing it on Twitter, I would have laughed. Did I hope things like this would happen? Of course – did I think it would, of course not. Goes to prove it never hurts to dream big. a) yes it’s a thing. c) It’s a bit of fun – who cares that it’s not a ‘true’ selfie. Are they smiling & enjoying it? Good. d) This will not solve any problems, stop analysing it. e) Just enjoy it or mute it but don’t complain, it’s one day. f) The tag is #MuseumSelfie but if you use ‪#‎MuseumSelfieDay‬ or make up your own, it’s all good. No one will scorn you.